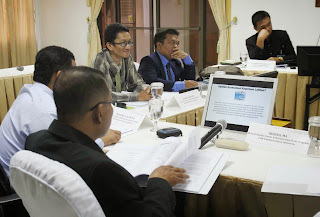 On its sixth Customized program arranged by CPSC, the Universitas Islam Negeri (UIN) Raden Fatah, Palembang, Indonesia sent 25 senior administrators and faculty members to gain insights on Higher Educational Management from July 17-23, 2016 at CPSC, Manila, Philippines. This year's batch was led by Prof. Dr. Izomiddin, MA, Head of Project Implementing Unit. The program was organized in response to the growing technological and development divide and in an effort to integrate various bodies of knowledge and sciences with Islamic teachings. Recent developments in the Indonesian educational system made it imperative for Islamic state institutes to institute excellence, sound leadership and quality culture in educational institutions to ensure delivery of its services to its stakeholders. With the assistance from the Islamic Development Bank (IsDB), and infrastructure developments and capacity building programs for officials, faculty and staff, such as CPSC programs were organized with the hopes of strengthening these institutions. The program design enabled the participants to be exposed to various systems and practices related to management of higher education institutions. Themes discussed during the program include: (1) Management Concepts and Paradigms of Improving Institutional Management in Higher Education, (2) Information and Communication Technology Applications in Higher Education, (3) Developing a Corporate Plan and the Strategic Planning Process, (4) Action Planning on Management of Higher Education Institutions and (5) Educational Transformation through Leadership. Tasks such as environmental scanning, formulation of a strategic planning framework and leadership style surveys were implemented alongside lectures to monitor the progress of the participants. An action plan on institutional management was also required at the end of the program to finally convert these lessons into concrete plans for future, anticipated implementation. Tours to higher education institutes in Manila such as the Asian Institute of Management and University of the Philippines-Diliman were also included in the 5-day program. Tours around Manila were also included to enable the participants to appreciate the sights of the host city. First started in 2014, CPSC has successfully implemented customized programs in management not only for the administrators in its Raden Fatah, Palembang campuses but also for other campuses such as in Medan (IAIN Sumatera Utara), Mataram and Walisongo Semarang. The current program was already the sixth of its kind organized under the CPSC-UIN partnership at the time when it the latter was still a State Islamic institute (IAIN). The success of the program strengthened IAIN's faculty and staff through exhibited benefits that the trainees gained, which contributed to IAIN's conversion to its current status as a university. The program was supervised by CPSC Acting Director General, Dr. G. Kulanthaivel. He was assisted by Dr. Romulita Alto, CPSC Short-Term Faculty Consultant and Dr. Zulkifli Zakaria, Former CPSC Short-Term Faculty Consultant and the current Chairman and Chief Executive Officer of Britenvision PLT, who conducted some of the lectures in Bahasa Indonesia to facilitate the ease of communication and understanding. The program ended on a very delighted and appreciative remarks from the participants for CPSC's efforts in ensuring its smooth implementation. In further strengthening its reputation as the main training provider and capacity builder for education in the region, the Colombo Plan Staff College (CPSC) welcomed 26 administrators and staff members from the Universitas Islam Negeri (UIN) in Medan, Semarang, Palembang and Universitas Islam Negeri Institut Agama Islam Negeri (IAIN) Mataram, Indonesia. This program was the sixth of its kind organized by CPSC for UIN and IAIN for the past two years. The delegation was headed by Dr. Candra Wijaya, Secretary of the Department of Islamic Education Management, Faculty of Tarbiyah, UIN Sumatera Utara, Medan. The program aimed to instill the regional and country-based educational management trends and their implications to enable the participants to have an understanding of modern educational management concepts, practices and set their future directions and aid them in identifying practices and systems for educational excellence. The program was designed to familiarize them to the applications of ICT integrated teaching and learning environment in Higher Education. Prof. Dr. G. Kulanthaivel, Officer-in-Charge, provided overall coordination and guidance. The theoretical and practical inputs were delivered by CPSC's pool of faculty namely Dr. Romulita C. Alto, Short-Term Faculty Consultant and Maj. Assoc. Prof. Dr. Mohamad Hisyam Mohd Hashim, Former CPSC Short-Term Faculty Consultant and currently Deputy Dean (Student Affairs and Alumni) of the Faculty of Technical and Vocational Education, Universiti Tun Hussein Onn Malaysia (UTHM). In addition, Dr. Zulkifli Zakaria, Former CPSC Short-Term Faculty Consultant and Chairman and Chief Executive Officer, Britenvision PLT provided a virtual lecture through Skype. The program instilled topics and tasks on educational transformation through leadership, management concepts and paradigms of improving institutional management in higher education, developing a corporate plan and strategic planning process and ICT applications in higher education. An online lecture on teamwork building for enhanced productivity was also included in the program. A study tour to the University of the Philippines-Diliman (UP) and Asian Institute of Management (AIM) was organized to further expose them to the applied good practices of educational management in the Philippines. They were also taken around the famous sights in Manila such as Intramuros and Rizal Park to orient them regarding the history and culture of the Philippines. 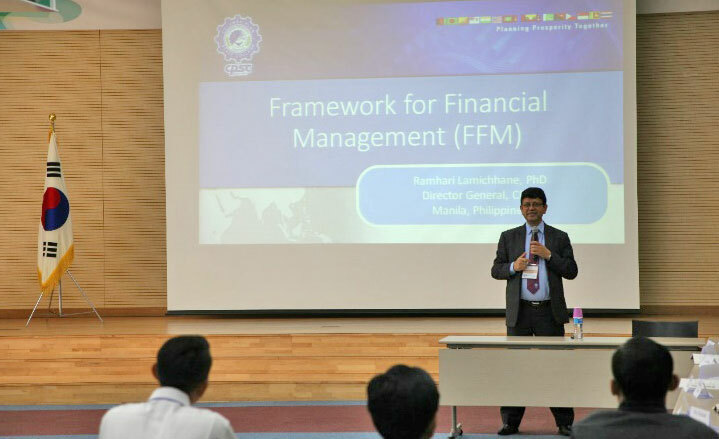 The CPSC Director General, Dr. Mohammad Naim Yaakub, was invited as a speaker and panelist at the 5th International Accounting Conference and the 2nd Accounting Students Research Forum held at the Faculty of Economics and Business at the Universitas Indonesia in Jakarta last November 24, 2014. The conference, with the theme "The Accounting Profession Towards ASEAN Economic Community (AEC)", was organized by the International Accounting Conference and Student Forum (IACSF). The event gathered accountancy and finance professionals from all over the region and the world. In his presentation the Director General centered his main points on Higher Education in the ASEAN countries in which he detailed the educational structure, framework and systems being implemented by the countries in the region. His presentation also outlined the actions that are deemed necessary in achieving the desired goal in higher education among ASEAN community. He also explored the things that are needed to be done in order to prepare for the ASEAN single market, in which he provided some updates in the research issues and emerging topics concerning higher education. The keynote speaker for the event was the President of the ASEAN Federation of Accountants—AFA, Ms. Estelita C. Aguirre where she elaborated about the influence of the upcoming AEC on the accountancy field. Some of the speakers included Mr. Hatanto Reksodiputro, Former Secretary General of the Ministry of Trade of Indonesia, who emphasized his country's support for the AEC. He also discussed the pros and cons of AEC from Indonesia's economic, social and political perspectives. He also posed a question about the readiness of the countries to implement the AEC in 2015 and the preparations that are needed in addressing the challenges and promises of a single market in the region. Dr. Megawati Santoso, Directorate General of Indonesian Higher Education, further contributed to the enrichment of knowledge by presenting the country's best practices in Higher Education vis-à-vis the future challenges and plans considering the implementation of the AEC. Ms. Lucy Tjahjadi, CEO of Cargill, discussed the user expectations about accountant qualifications among the ASEAN countries and facilitated the sharing of experiences regarding accountant qualifications in different ASEAN countries. Other issues in her presentation include current strategies of Human Resources such as the benefit of rotating tasks among the employees. The conference tackled several inter-country issues and facilitated the exchange of information especially in the field of accounting and finance. As the Customized Program on Educational Leadership and Management commenced Monday, the CPSC Director General, Dr. Mohammad Naim Yaakub led the CPSC Faculty and Staff in welcoming another batch of delegates from the Institut Agama Islam Negeri (IAIN) in Mataram, this time from West Nusa Tenggara, Indonesia, being held from November 10 to 14, 2014 at CPSC. In his welcome remarks, Dr. Naim said that the CPSC family is very happy to once again receive another batch from IAIN and that he feels proud that CPSC is a great part of the institution's quest to be a full-fledged university. He further invited all the participants to make CPSC its second home and grab the opportunity to be in such part of the world where six countries are together converging in harmony. Proving stronger ties with Indonesia, the latest Customized program is the fourth of its kind this year being organized by CPSC, following the successful conduct of the capacity building programs for IAIN - Sumatera Utara, IAIN Raden Fatah/ IAIN Mataram in June and September 2014 respectively. The program is designed to meet the specific needs of the institute's staff towards the transformation of IAIN from an institute to a full-fledged university. Dr. Ahmad Amir Aziz, M.Ag, Head of the Project Implementation Unit of IAIN leads the 15 staff members from IAIN. In response to the CPSC DG he expressed his gratitude to CPSC for warmly receiving his group. He introduced the institution and shared about their determined hope to be a full-pledged university and utilize whatever knowledge and capacity they would gain from the CPSC program and eventually contribute to their country in addressing challenges in the global education. He said that they are all excited to further work together with CPSC. The program is being supervised by Dr. Mohammad Naim Yaakub, CPSC Director General. Overall program coordination is being provided by Dr. Zulkifli Zakaria, CPSC Short-Term Faculty Consultant. Dr. Hazrat Hussain, CPSC Faculty Consultant and Dr. G. Kulanthaivel, CPSC Seconded Faculty Consultant also share their expertise in the whole duration of the program. The program aims to instill to the participants the regional and country-based educational management trends and their implications for sustainable human resources development with reference to the ASEAN countries context. It is also expected that the participants will have an understanding of modern educational management concepts, practices and set their future directions. The program is set to enhance awareness of participants on identifying practices and systems for educational excellence through transformational leadership and be able to prepare an action plan that will guide the institute towards becoming a full-fledged university. Themes such as: Teamwork Building for Enhanced Productivity and Effectiveness, Educational Excellence through Accreditation, and Quality Management, Developing a Strategic Planning Framework for Educational Organizations, Educational Transformation through Leadership and Challenges in Education towards the Realization of ASEAN Community 2015 are integrated in the program in order to provide a thorough academic experience to the participants. Study visits to institutions such as the Asian Institute of Management, National Commission of Muslim Filipinos and the Commission on Higher Education were also organized. The participants will also visit some of the famous landmarks in Manila such as Intramuros and the Quiapo Golden Mosque to showcase the history and beauty of the host city during their five-day visit. The Colombo Plan Staff College (CPSC) welcomed 18 academic officers from the North Sumatera State Institute of Islamic Studies (or IAIN-Institut Agama Islam Negeri) on a five-day capacity building on Professional Development and Curriculum Development in Higher Education from September 15-19, 2014. 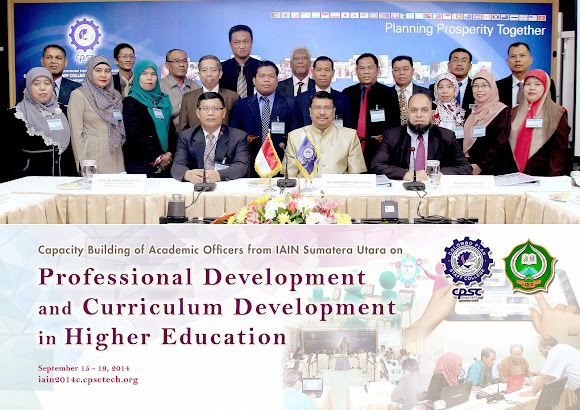 This collaboration between CPSC and IAIN-North Sumatera was the second of this kind for this academic year (see related news http://www.cpsctech.org/news-and-programs/programs-conducted/item/297-cpsc-indonesia-jointly-hold-customized-program-on-educational-leadership-and-management-ink-partnership-for-educational-and-institutional-benefits). Envisioning to be the center of multidisciplinary development of Islamic studies in Indonesia, IAIN North Sumatera is mandated to provide international competitive Islamic education in the fields of science, technology and arts. It is also committed to develop Islamic studies research relevant to the needs of the community and promote Muslim community empowerment. Currently, IAIN aspires to transform itself into a university, in which the upgrading of systems and services is of utmost importance and priority to them. Thus, CPSC has been selected by IAIN to assist in the capacity building aspect of such goal, and equip the institute’s heads of study programs with the necessary knowledge and competencies that will enable them to achieve that goal. The program aims to encourage the interest of the participants regarding the regional and country-based curriculum development trends and their implications for sustainable human resources development with reference to the ASEAN countries context. The training program is also designed to enable the participants to identify practices and systems for educational excellence through curriculum development and have an understanding of need for professional development concepts, practices and directions for the future. At the end of the program, the participants are expected to prepare an Action Plan that will guide the institute towards becoming a full-fledged university. The delegation is led by Prof. Dr. Amroeni Drajat, MA Taskforce for Academic Affairs of IAIN North Sumatera. The delegation is composed of heads of the different study programs currently being offered by the institution. Overall supervision of the program is being provided by the CPSC Director General, Dr. Mohammad Naim Yaakub. Dr. Hazrat Hussain, CPSC Faculty Consultant, is in-charge with the program coordination while Dr. Zulkifli Zakaria, CPSC Short-Term Faculty Consultant, is also providing his expertise as a Resource Person. The opening program commenced with the exchange of well-wishes and appreciations. Dr. Naim, addressing the participants in Bahasa Indonesia and English, commended the efforts of IAIN in developing their human resources through intensive trainings on management. He also cited the importance of the upcoming ASEAN integration and its impact in the development of economies in the region. 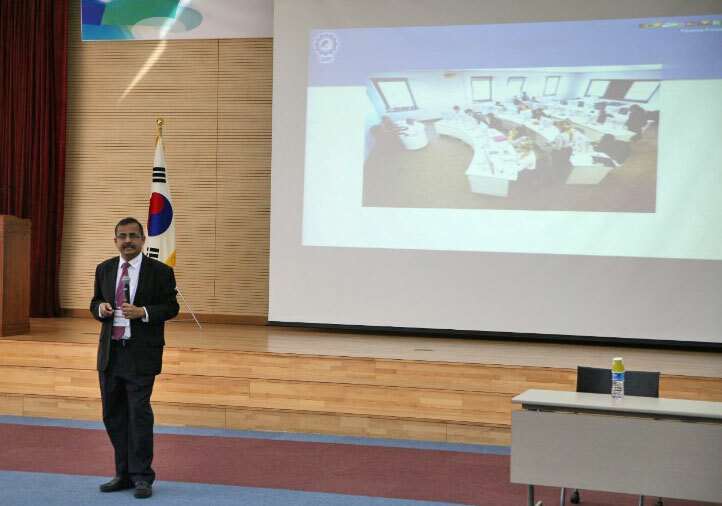 He also mentioned CPSC’s success in inculcating the lessons from the training programs to its participants, citing a case of one trainee participant from Indonesia applying the management techniques that she learned in CPSC to efficiently manage her division. Dr. Drajat, representing IAIN North Sumatera, conveyed his appreciations to CPSC in its efforts for the program on behalf of the delegation. He also expressed the relevance of the program in fulfilling their aim in making the institute a center of development of multidisciplinary Muslim Studies in Indonesia. Some of the participants during one of the lectures The five-day program tackles topics that talks about professional and curriculum development. This includes the following: (1) Analysis of Needs for Curriculum Development and Training, (2) Current Practices in Curriculum Development in Higher Education, (3) Pedagogic and Instructional Practices in Current Educational System and (4) Training and Development for Continuous Professional Development. A special lecture about the new paradigms of education in the modern era was also delivered by Dr. Naim in Bahasa Indonesia and English. To further refine their skills in curriculum enhancement and development, tasks such as the Training Needs Analysis, Curriculum Analysis and Formulating Institutional Objectives are being given as exercises. At the end of the seminar, participants are expected to come up with an action plan that will guide the institute towards becoming a full-fledged university. The program also included visits to relevant universities in the city such as the Asian Institute of Management in Makati and the University of Asia and the Pacific in Ortigas. A half-day tour around the city of Manila is also included in the program to spark the interest of the participants on the history and culture of the city. The IAIN delegation at the Asian Institute of Management (AIM), Makati. At the peak of technological and development divide, the initiative to integrate Southeast Asian Nations into an ASEAN Community is relevant as it shall narrow the gap and enhance ASEAN’s competitiveness as a region. It is imperative to institute excellence, sound leadership and quality culture in educational institutions. Realizing this, the Colombo Plan Staff College conducted the Customized Program on Capacity Building on Educational Leadership and Management held at CPSC from September 1-5, 2014. At the end of the training program, participants are expected to be aware of the regional and country-based educational management trends and their implications for sustainable human resources development with reference to the ASEAN countries context. They are also expected to have an understanding of modern educational management concepts practices and set their future directions. The program also aims to inculcate the relevance of identifying practices and systems for educational excellence through transformational leadership. The delegation is composed of 15 Indonesian officials from the Institut Agama Islam Negeri (IAIN) Campuses in Palembang, South Sumatra and Mataram, West Nusa Tenggara. The delegation is led by Dr. Heri Junaidi, M.A. Vice Rector II of IAIN – Raden Fatah Palembang and Dr. H. Achsanuddin, M. Pd. Vice Rector II of IAIN – Mataram. Overall supervision of the program is being managed by the CPSC Director General, Dr. Mohammad Naim Yaakub, while, overall coordination is being handled by Dr. Hazrat Hussain, CPSC Faculty Consultant. Dr. G. Kulanthaivel, CPSC Seconded Faculty Consultant provides his expertise. The opening program commenced with the exchange of well-wishes and appreciations. Dr. Naim, addressing the participants in Bahasa, commended the efforts of IAIN in developing their human resources through intensive training on management and embracing the culture of quality. He also cited the importance of the upcoming ASEAN integration and its impact in the development of economies in the region. Dr. Junaidi and Dr. Achsannudin, representing the IAIN network, also expressed their appreciations on the organization of the program. They also cited some positive developments in their colleges and their continuous efforts to provide quality services to their constituents through continuous capability enhancement. The five-day program is set to tackle topics that enhance the management expertise of administrators. This includes the: (1) Development of a Strategic Planning Framework for Educational Organizations, (2) Enhancing Educational Excellence through Accreditation, Quality Management and Strategic HR; (3) Educational Transformation through Leadership and (4) Teamwork Building for Enhanced Productivity and Competitiveness. To further hone their skills, tasks such as the Identification of Institutional Vision and Mission, SWOT Analysis, Exercises on Quality Management and Strategic Human Resources and the Development of Leadership Skills are being given as exercises. At the end of the training, participants are expected to come up with an action plan that will guide the institute towards becoming a full-fledged university. The program also included visits to relevant institutions such as the Asian Institute of Management and the University of the Asia Pacific. A half-day tour around the city of Manila is also included in the program to spark the interest of the participants on the history and culture of the city. Eyes set on enhancing capability of its academic and administrative staff in order to actively participate in the ASEAN Community, Indonesia’s State Institute for Islamic Studies-IAIN North Sumatra joined hands with the Colombo Plan Staff College (CPSC) in organizing the Customized Program on “Capacity Building of SIIS-IAIN North Sumatra Lecturers and Staff on Educational Leadership and Management” from June 2 to 6, 2014 at CPSC Manila. Also in view of meeting the specific needs of the 19 lecturers and staff towards the transformation of the institute into a full-fledged university, the program was designed to deliver lectures, exercises and presentations relevant to country-based educational management trends and their implications for sustainable human resources development with reference to the ASEAN countries context. The inaugural ceremonies for the program commenced Monday at the CPSC conference room where the CPSC Director General, Dr. Mohammad Naim Yaakub, welcomed the participants and officials of SIIS-IAIN headed by Prof. Dr. Hasan Bakti Nasution, Vice Rector II and Dr. Phil. Zainul Fuad, MA, Project Manager. Dr. Naim briefly shared about CPSC’s beginnings from Singapore to Manila, its mandate, programs, activities, networks and development partners. He also cited about the design and components of the program which include blended learning systems such as face to face lectures, web-based teaching and learning system, computer hands on, online tests and assessments, study visits and socio-cultural activities. He wished for the success of the program and pledged his commitment to the participants that the CPSC management and staff had put up a good program for the institution. In response, IAIN’s Vice Rector Prof. Dr. Nasution, expressed his appreciation to CPSC in working with them for the capacity building of their personnel and for the benefit of the institution. He wished that they will be able to share all the learning they would gain from the program with the other 63 higher education institutions in Indonesia. He also briefly introduced about the establishment of SIIS-IAIN in 1973 and its current composition of 400 lecturers with 9,000 students. He hoped that the program will provide benefits to both CPSC and IAIN. Dr. Hazrat Hussain, CPSC Faculty Consultant, who acts as Program Coordinator and Resource Person for the program provided the orientation and other important information and details pertinent to the program implementation to enlighten the participants. Dr. Paiboon Saiyawongs, Short-Term Consultant will also act as Resource Person for the program. In significantly giving birth to a new partnership between the two entities, CPSC and IAIN inked their cooperation through a signing of a Memorandum of Understanding (MOU) during the opening ceremonies of the program. The MOU solidifies the two new allies’ agreement on exploring and identifying opportunities for: potential joint activities on education and training, training professional staff members, accreditation training and accreditation and certification of educational institutions, faculty and staff exchange and for sharing of facilities and human resources. The MOU was signed by Dr. Naim for CPSC and by Prof. Dr. Nasution for IAIN witnessed by Dr. Hussain and Dr. Phil. Fuad for CPSC and IAIN, respectively. Prof. Dr. Hasan Bakti Nasution, Vice Rector II, SIIS-IAIN (left) and CPSC Director General, Dr. Mohammad Naim Yaakub (right) with Dr. Phil. Zainul Fuad, MA, Project Manager, IAIN (right photo, first fr. L) and Dr. Hazrat Hussain, CPSC Faculty Consultant (rightmost) during the MOU signing. The Colombo Plan Staff College’s (CPSC) Director General Dr. Mohammad Naim Yaakub attended the 43rd Colombo Plan (CP) Consultative Committee Meeting from October 11–12, 2012 at the Novotel Grand Kawanua, Manado, North Sulawesi, Indonesia to report CPSC’s annual reports for fiscal years 2009 – 2010 and 2010 - 2011. The Director General’s report stressed on the successful completion of CPSC’s operational targets and implementation of planned programs and activities with major innovative undertakings, such as the launching of Green CPSC movement and significant milestones, such as the notable improvement in the number of training beneficiaries and programs. The biennial meeting, which is the highest forum in the Colombo Plan, provides a venue to exchange views on current development problems facing member countries and review the work of the Colombo Plan in economic and social development within the region. This year’s theme is “Bringing the Marginalized to the Mainstream” to enable CP to expand the scope of programs and target beneficiaries to include the empowerment of marginalized communities in CP member countries. The meeting was attended by representatives from Colombo Plan Secretariat headed by the Secretary General, Mr. Adam Maniku and other officials from Colombo Plan member countries at the level of ministerial or senior official rank. Aside from welcoming Brunei Darussalam and Saudi Arabia as new members of CP, two-year reports from CP and CPSC, and country presentations, cultural nights were also organized to showcase traditional dances, songs, and instruments of Manado, Indonesia. A site visit to Woloan Village in Tomohon, where special knock down houses based on the Minahasa traditional houses are being produced, was also organized. The meeting generated a report which will be finalized upon recommendation of a drafting committee.